Last week, TP Vision announced a range of three Philips OLED TVs for 2018. While these are largely a continuation of the 2017 model, there are some new features planned. Philips also gave us a sneak peek of “the next innovation” in video processing. Here’s what we learned. There are three new Philips OLED TVs planned for the first half of the year. 973 is the flagship whereas 873 is identical to the current POS9002 – just larger. 803 will arrive this summer with a new minimalistic design in 55 and 65 inch formats. The company continues to tout mainly OLED technology, the P5 video processor, Android TV, and Ambilight. That is because these TVs are largely a continuation of the much-acclaimed POS9002 OLED. 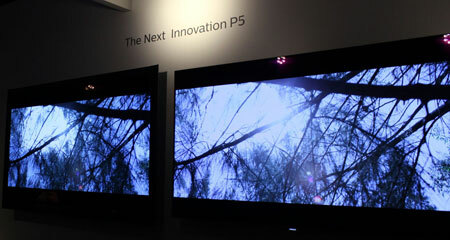 Philips has decided to use OLED technology in its 8 and 9 series TV, with the rest of the line-up being LCD. 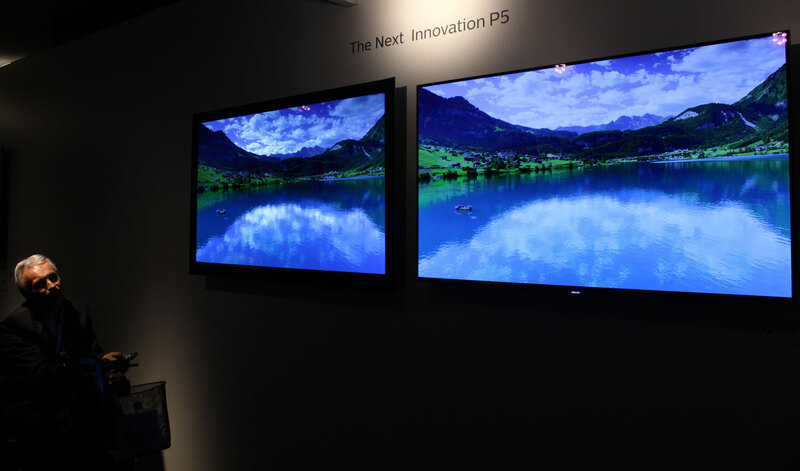 All three OLEDs TV ranges will offer identical picture quality, the company said. OLED is a self-emitting picture technology, meaning that each pixel can generate its own light. This is important when reproducing High Dynamic Range video because of the high contrast required. With OLED – and soon microLED – luminance and colors can be controlled on a pixel level, and because black, the canvas that you paint on, is perfect, picture on the screen look very intense and rich. 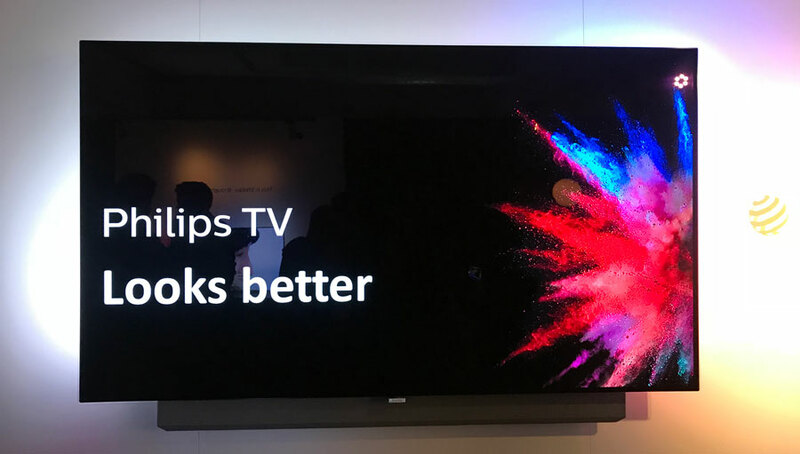 This is true for all OLED TVs but Philips was eager to highlight how its P5 video processor can improve poor source material or even “enhance” colors and motion – which you will see in a video in a moment. One way that Philips hopes to stand out is by implementing HDR10+ support. This HDR format, pioneered by Samsung, is an open alternative to Dolby Vision. Through the use of dynamic metadata HDR video can be optimized on a scene-by-scene basis to ensure better representation of specular highlights and shadow details, and luminance in general. 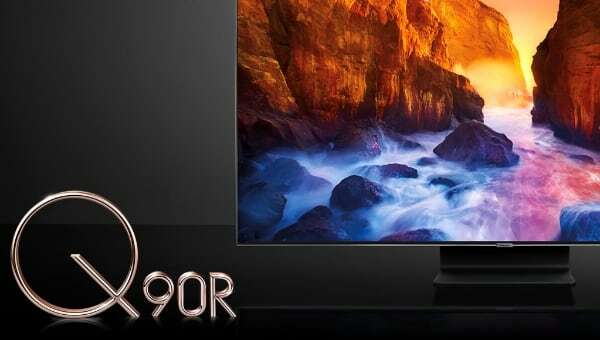 Philips said that HDR10+ is coming to the 2018 TVs via a later firmware but said that plans for the 2017 TVs have not yet been finalized. 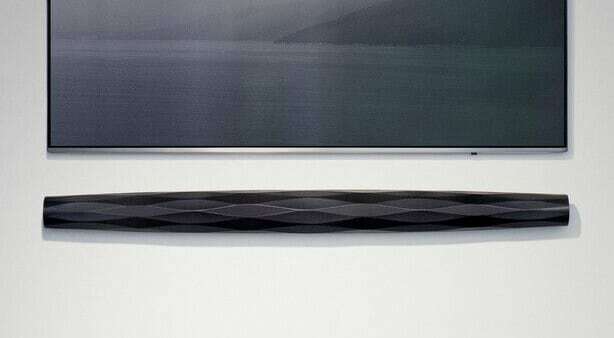 The 973 flagship is an elegant and extremely thin TV. 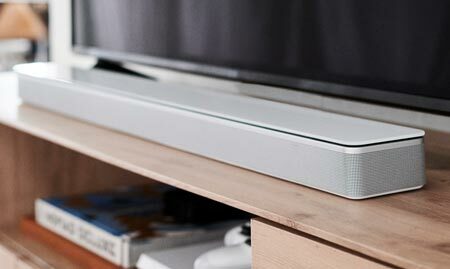 Philips has moved most of the controlling electronics into the soundbar, which can flip 90 degrees if you wish to wall-mount the TV. 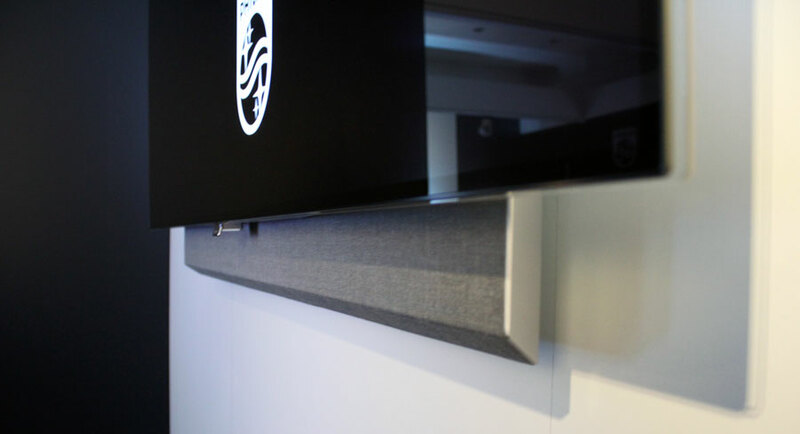 The soundbar is covered in a fabric that feels soft yet durable. While most people want the built-in speakers to disappear, Philips believes that there is a market for an integrated solution with proper sound. To our eye 973 looked very elegant and it has already been awarded the Red Dot design award. Unfortunately, the two samples were assembled by hand so we were not given the opportunity to hear the 60W 6.1 speaker unfold. 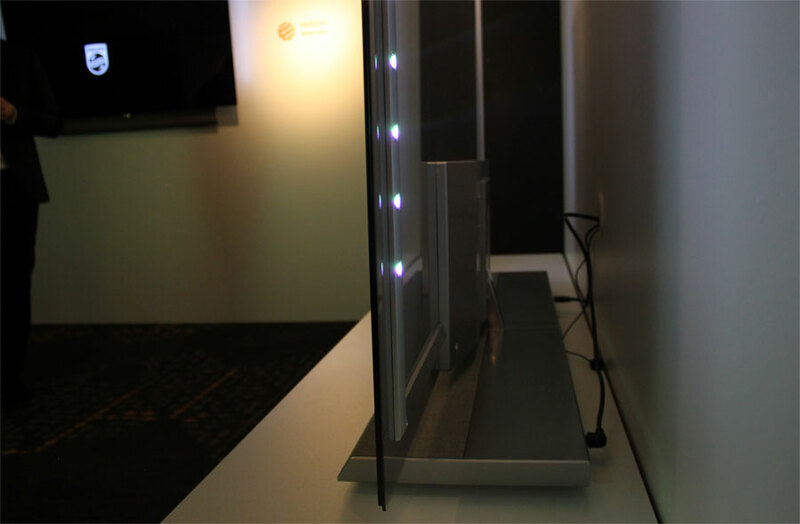 We asked Philips’ team responsible for design whether they are exploring a module based OLED TV design, more specifically a super-thin OLED TV with an external electronics box. While 973 is halfway there, it still has a bump on the back. Curiously, Philips said that the only component inside the box is the TCON (timing controller). The rest is in the soundbar. TP Vision, responsible for Philips TVs in Europe, does not yet have access to LG Display’s OLED panel with external TCON that LG is using in its “wallpaper” OLED TVs. Another detail to keep in mind here is that Philips TVs need some space behind the TV to make Ambilight work so a wallpaper model like LG’s W8 may not be the obvious path forward for the company. Nevertheless, Philips said that it is considering a more modular solution so we will see what happens. The 65-inch 873 looks exactly like the current 55-inch POS9002 because it is the same TV. Philips has simply decided to rename it for 2018 while the 55-inch POS9002 will carry over. 803 on the other hand is a new design, coming in 55 and 65 inch formats this summer, where the logo has been removed from the bezel. “Philips” is printed on one of the two legs but it is nevertheless a bold move. If you decide to put 803 on a wall, there will be no visible distractions on the frame. Of course, you will still recognize it as a Philips TV as soon it turns on because of Ambilight. 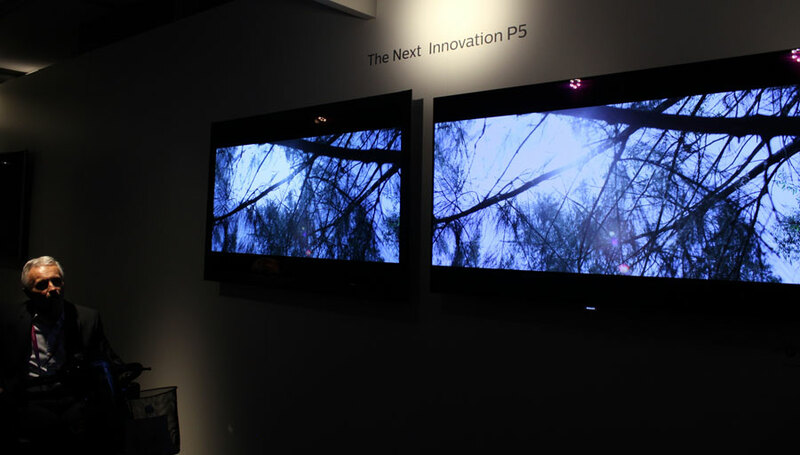 But, coming back to picture quality, TP Vision had brought in Danny Tack, Director of Product Strategy & Planning, to hammer home the message about the P5 video engine that was introduced last year and that it being expanded to many more TVs this year. We have included a video of his presentation below. The exciting news that Danny teases in the beginning is not in the video as we were not allowed to film during this séance but jump to the next section for more information. What Danny Tack was teasing at the beginning of his presentation is what Philips calls the “the next innovation” in video processing. It will be an evolution of P5 but besides the live demo, details were sparse. What we saw was (see photos below – the new processor is included in the OLED panel on the left) in essence a way to process a video scene to enhance color saturation as well as details in shadows and highlights. The TVs were in the ‘Vivid’ mode so of course this applies to buyers who like these kinds of enhancements. However, it sounded like this is just one capability of the “next innovation” that will require new silicon to deliver the whole package (Movie mode turns off all of these enhancements). We will likely get more information later this year – probably at IFA 2018. We also asked Danny Tack if he could highlight Philips’ plans for HDMI 2.1. He said that it is too early to talk about the specifics of HDMI 2.1 since none of the 2018 Philips TVs will include the new interface standard. The HDMI Forum has confirmed that it will be possible to include select elements of HDMI 2.1 into current TVs but TP Vision had nothing to say on the matter. 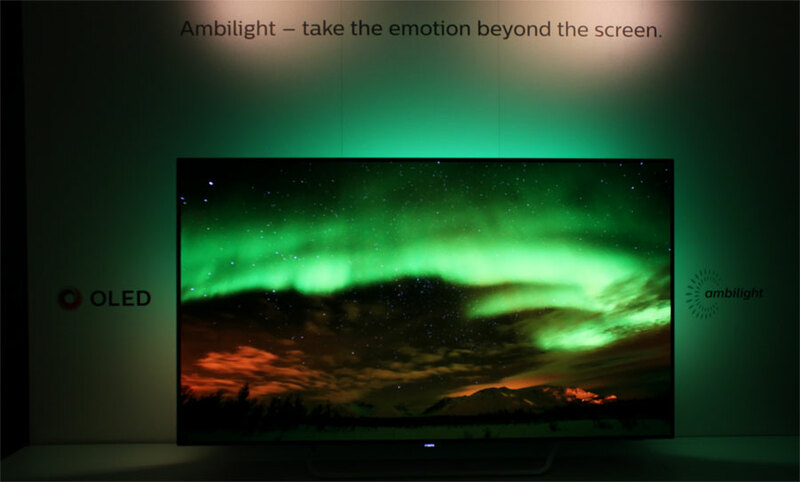 The company sees OLED as the best technology for high-end TVs, at least for the time being. The new LCD TVs will complete the line-up from the 8 series and down. 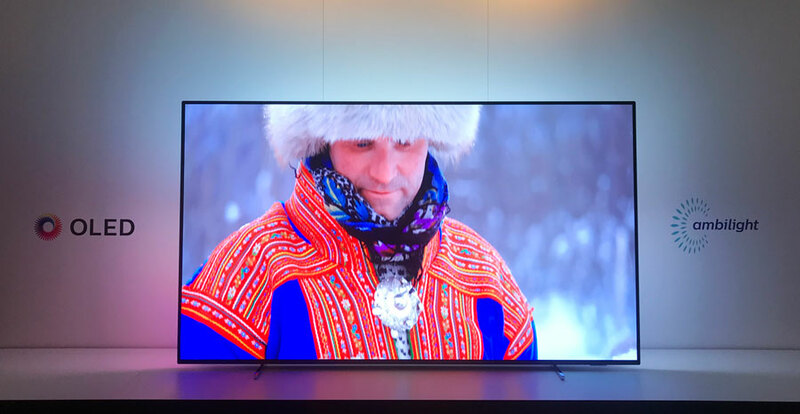 We saw most of the new LCD TVs in action and these are unlikely to move the needle but one interesting tidbit here is that Philips will replace its current quantum dot LCD with “NanoLED” LCDs. What that means is that Philips new 8 series LCD TVs will feature LG Display LCD panels rather than Samsung LCD panels. Almost everyone, reviewers and buyers included, seemed disappointed about Samsung’s panels last year and Philips specifically said that those viewing angle improvements that Samsung had promised never materialized, which is an unusually honest answer from a large corporation. Danny Tack confirmed that “NanoLED” LCD TVs will reproduce around 90% DCI-P3 colors and very wide viewing angles but acknowledged that they will not go as bright as OLED. Based on what we saw, picture quality cannot remotely match the OLEDs. We have said many times in past that if you value HDR you should opt for OLED. The 2018 Philips LCD line-up is unlikely to change our view on that. The company confirmed to us that it is planning to bring Android 8, or Android Oreo, to its TVs. It is a “second half of the year” project if everything goes according to plan. 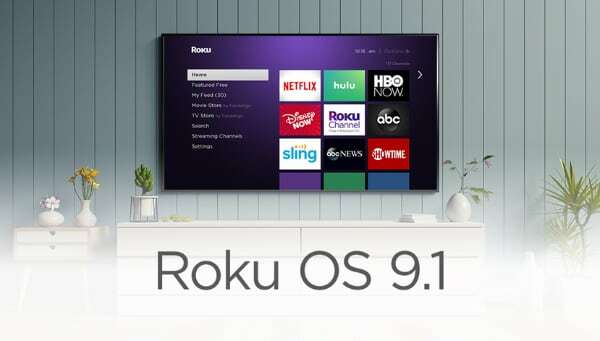 Android 7, or Android Nougat, is currently rolling out to Philips TVs in Europe, and the company said that it has just initiated the last stage of the roll-out for TVs like POS9002. The Nordic countries will receive it first. Between the release of Android 7 and 8, respectively, the company is planning to add Google Assistant capabilities to its 2018 and select 2017 TVs. At launch, Google Assistant will speak English, with French, Deutsch, Italian, and Dutch expected to arrive later in 2018. 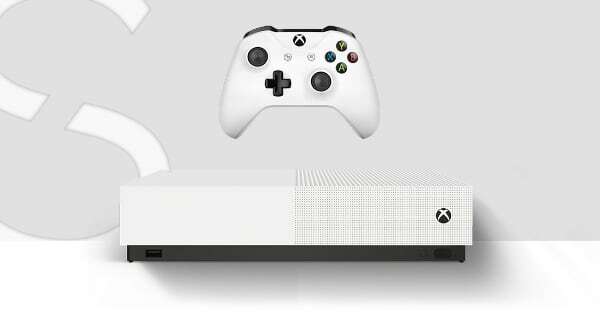 The high-end models will include an additional remote control in the box. 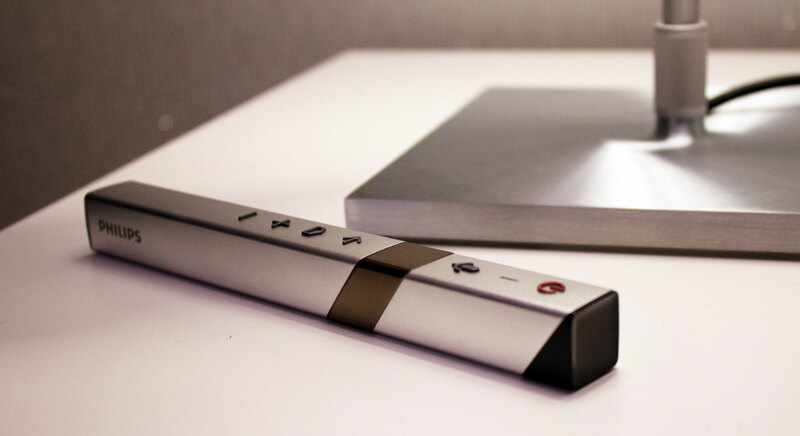 It is a new, simpler remote designed for those users who want to use mainly the smart features of the TV. 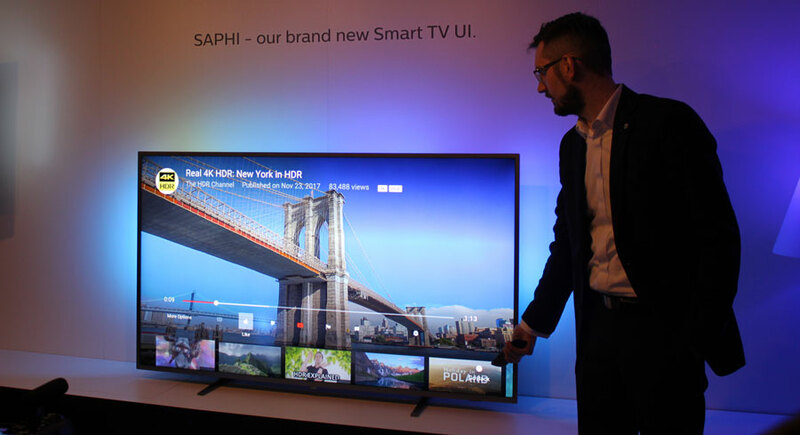 As you may have noticed, the company will furthermore introduce a ‘Saphi’ smart TV platform. This is a linux-based platform that will be used only in the low-end models. We saw a brief demonstration of the system and it looks fairly solid with a selection of the most important apps (Netflix, Amazon and YouTube). It even supports VP9-2 for HDR playback on YouTube. Philips is still fully committed to Android TV but wants a different solution in its low-end TVs. 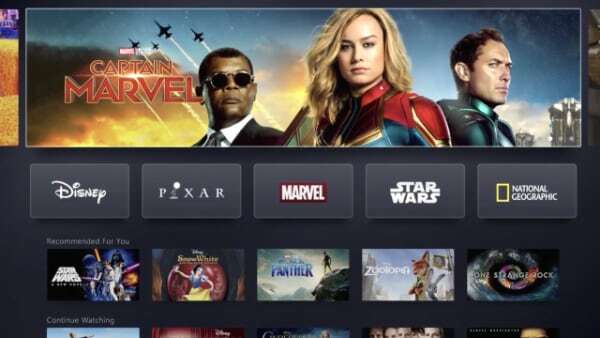 In Amsterdam, the company demonstrated a new addition to Ambilight. If you own a Philips TV you may know that it can synchronize Ambilight with Philips HUE lighting. However, in the past there has been a delay between Ambilight and Hue lamps. The 2018 TVs will, after an update, offer a low-latency Ambilight + HUE solution. There will be an API available to game developers so that it can be included directly into the game engine. See the video for more details.